Remember the Cath Kidston tape I bought a few days ago? Well this evening I had a little play with it and came up with this little flag cake topper. What do you think? Obviously it is hopefully destined to adorn a cake, and not a spool of twine! 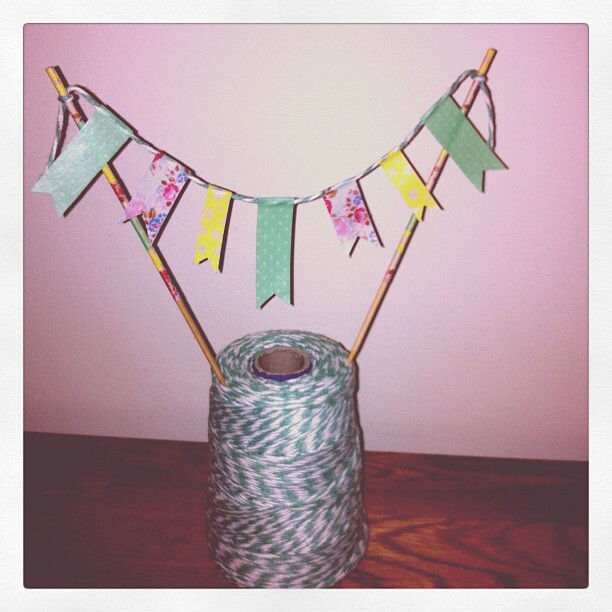 I used my green and white twine to suspend the little flags, and also used tiny pieces of tape to make stripes on the skewers. I'm really pleased with it, and tomorrow I'm hoping to find time to make a cake to display it a bit better before adding it to my shop! I also had a bit of a fabric splurge today, and Im planning a few new quilts and cushions, so the shop should be launching very soon...I'm really rather excited!